Tank Stream Hotel's 'all inclusive' rate concept treats guests to free high-speed WiFi, free in-room movies, complimentary non-alcoholic mini bar as well as Premium teas from Caffee Aurora by Vittoria and Espresso coffees. As part of the St Giles Hotels group - a growing global collection of premier hotels, Tank Stream Hotel is located in the heart of Sydney, offering corporate and leisure travellers compact and stylish rooms in premium location at great value. Le Petit Flot restaurant, located on level 2 of the hotel, serves contemporary French cuisine with a Japanese twist in an elegant and casual dining space. The restaurant can cater to bespoke corporate events, private meetings as well as special occasions with its private dining room. 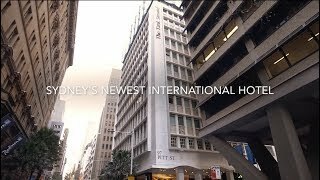 Wynyard train station is a two minute walk from the hotel, Circular Quay is a seven minute walk, the Westfield Sydney Shopping Centre is also a seven minute walk from the hotel. Sydney airport is 25 minute travel on public transport.